MainAll NewsJewish WorldHow many 'Lost Jews' are there worldwide? How many 'Lost Jews' are there worldwide? Gov't report claims there are close to 100 million 'lost Jews' or 'crypto-Jews' around the world. Will Israel reach out to them? As many as 95 million people worldwide may be descended from Jews, a new government report claims. The report, which was produced by a special committee formed by the Diaspora Affairs Ministry in 2016, suggests that in addition to the roughly 14 million people who identify as Jews around the globe, there are some 95 million more people who are likely descended from Jews who assimilated or were forced to convert – groups sometimes referred to as “lost Jews”. The notion of far-flung communities reclaiming their ancestors’ Jewish heritage is hardly new. Perhaps most famous are the “Anusim” (Hebrew for “Coerced Ones”), sometimes referred to as Marranos – Jews from the Iberian Peninsula who were forced to convert to Catholicism. Despite having nominally converted, many clandestinely practiced Judaism. As Spain and Portugal settled South and Central America, some Anusim settled in the New World, in some cases covertly maintaining their Jewish faith. Other examples of lost Jewish communities can be found in Africa and Asia. 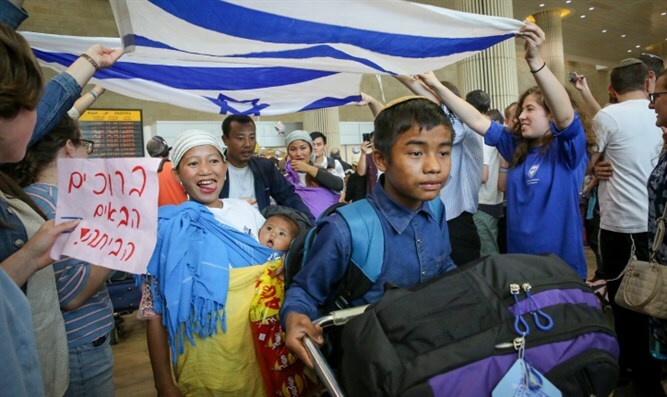 Tens of thousands of Ethiopian Jews immigrated to Israel since the early 1980s, including members of the Beta Israel community known as the Falash Mura – descendants of Jews compelled to convert to Christianity. In 2005, Chief Rabbi Shlomo Amar recognized the Bnei Menashe, a community from eastern Indian which claimed descent from one of the Ten Lost Tribes forced into exile 2700 years ago, as the descendants of a long-lost Diaspora Jewish community. Thousands of Bnei Menashe have immigrated to Israel over the past two decades, where they undergo conversions by the Chief Rabbinate. According to the report by the Diaspora Affairs Ministry’s special committee, however, there are potentially tens of millions of “lost Jews” around the world. Beyond the roughly six and a half million Jews now living in Israel and close to eight million Jews in the Diaspora, the report claims there are another five million Jews who converted to other religions or are the immediate descendants of individual Jews who converted worldwide. Under Israel’s Law of Return, these individuals are not eligible for Israeli citizenship, though the committee suggests the government could reach out to those among this category who are receptive to the prospect of returning to their Jewish roots. A far larger category, however, is that of so-called “lost Jews” who were forced to convert en masse, or were compelled as a community to practice Judaism only in secret. Communities with known ties to the Jewish people include some 35 million people, the report claims, while a further 60 million have unrecognized or undeclared ties to the Jewish people. These 60 million lost Jews include “descendants of Jews, descendants of forced converts, and additional communities with an affinity to the Jewish people but are not currently declaring so or are unaware of it,” Haaretz cited the report as saying. The committee which produced the report for the Diaspora Affairs Committee recommended that the government establish special research body to learn more about lost Jews around the world, and reach out to them. While some have criticized the recommendation, saying it violates the Jewish ethos of not actively seeking out converts, the president of one of the largest organizations reaching out to those with Jewish heritage defended the idea. “We aren’t interested in missionizing, that’s not what we’re about at all” Ashley Perry, the president of the Anusim outreach organization Reconectar, told Arutz Sheva. Raised in London, Perry served as an adviser to the Israeli Foreign Ministry and later to Israel’s Deputy Prime Minister. He currently serves as President of Reconectar, as well as the Director-General of the Knesset’s parliamentary Caucus for the Reconnection with the Descendants of Spanish and Portuguese Jewish Communities. Perry suggested that despite the seemingly large numbers of people with Jewish heritage cited by the Diaspora Affairs Ministry’s special committee in its report, the real number could be even larger, estimating that there are at least 14 to 15 million self-identified Bnei Anusim (“Descendants of the coerced”), with as many as 100 million descendants worldwide of Iberian Jews who were forced to convert to Catholicism. “Given the birthrate over the years, studies have estimated the number of descendants of these Jews at anywhere from 100 million to 150 million and even some who claim there are as many as 200 million around the world descended from Spanish and Portuguese Jews,” Perry told Arutz Sheva.